Managers around the world identify risk of liquidity problems as the primary barrier of their decisions. In the global economy, in the turbulent environment, the effects of companies' insolvency risk lead to many operational and strategic problems also causes of contagion effect. Therefore, it is important to study the phenomenon of insolvency, determinants that shape it as well as seek opportunities to reduce the risk of this problem. The aim of the study is to identify the determinants that affect the risk of insolvency of companies in Poland as well as propose a model of the effects of companies' insolvency based on the profiles of risk factors and the actions as well as instruments to successfully manage the risks of default. We used Logit Model and Panel Data. Our findings suggest that appropriate debt management, as well as the need for synchronization of receipts and expenditure, which should secure the current payments in a short run is crucial in identifying and reducing the risk of insolvency, in a short term (in relation to all groups of companies). However, in the longer term, consideration should be given to the different factors that can allow the identification of the risk of insolvency, which may further allow the entrepreneurs to make quick response, or spread out over time the operations (e.g. restructuring) and thus allow avoiding the insolvency. Hence, in private companies a sustainable performance should be instituted by the board of directors. Aguiar-Díaz, M., Ruiz-Mallorquí, V. (2015). Causes and resolution of bankruptcy: The efficiency of the law. The Spanish Review of Financial Economics, Vol. 13( Issue 2), pp. 71–80. Altman, E. (1971). Corporate Bankruptcy in America, Lexington, Mass: Heath Lexington. Argenti, J. (1976). Corporate Collapse, The Causes and Symptoms, McGraw Hill (in:) Zimmerman, F.M. (2002). The Turnaround Experience. The Real-world in Revitalizing Corporatioons, McGraw Hill. Beaver, W. (1966). Financial Ratios as Predictors of Failure, Empirical Research in accounting: Selected Studies. Supplement to the Journal of Accounting Research Volume 6, pp.71-87. Beerman, K. (1976). Possible Ways to Predict Capital Losses with Annual Financial Statements, Dusseldorf, University of Dusseldorf. Baxter R., Russell M., Ang R. (2007). Predictive Model of Insolvency Risk for Australian Corporations Australian Computer Society, Inc. This paper appeared at the Sixth Australasian Data MininConference (AusDM 2007). Gold Coast, Australia. Conferences in Research and Practice in Information Technology (CRPIT), Vol. 70. Elliehausen, G., Wolken, J., (1993). The demand for trade credit: an investigation of motives for trade credit use by small businesses. Board of Governors of the Federal Reserve System Staff Study 165. September, 1–18, Washington, DC. Ferreira, M. A., Vilela A. (2004). Why do Firms Hold Cash? Evidence from EMU Countries. European Finance Management, Vol. 10, pp. 295–319. Flagg, D., Kudrimoti, S., Margetis, S. (2011). Do management decisions matter when firms are in distress? RMIC,Vol.4 (Issue 9), pp. 1-19. 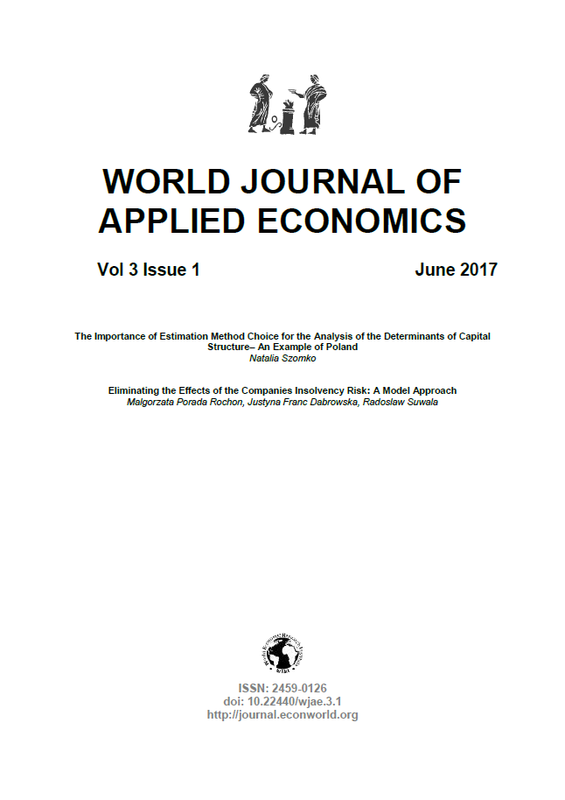 Franc-Dąbrowska J., Porada-Rochoń M., Suwała R. (2016), Enterprise insolvency and the effects on the local and regional community – the social economy perspective. Acta Scientiarum Polonorum. Oeconomia, Vol. 15 (Issue 2), pp. 37-47. Franc-Dąbrowska J., Porada-Rochoń M., Suwała R. (2015), Effects of cash flow management on SME insolvency: methodological approach. Proceedings of World Business, Finance and Management Conference : 14-15 December 2015, Rendezvous Grand Hotel, Auckland, New Zeland, pp. 88-97. Garcia-Teruel, P. J., Martinez-Solano, P.,(2008). On the Determinants of SME Cash Holdings: Evidence from Spain. Journal of Business Finance & Accounting, Vol.35(Issue1) & (Issue2), pp.127–149. Gruszczyński, M., Kuszewski, M. Podgórska, T.(ed) (2009). Ekonometria i badania operacyjne. Podręcznik dla studiów licencjackich., Wydawnictwo Naukowe PWN, Warszawa, Wyd. I.
Guney, Y. , Ozkan A., Ozkan N. (2003).Additional International Evidence on Corporate Cash Holding, Working Paper (SSRN Electronic Library). Kopczewska, K., Kopczewski, T., Wójcik, P. (2009). Metody ilościowe w R: aplikacje ekonomiczne i finansowe, CeDeWu. Koronacki, J., Ćwik, J. (2008). Statystyczne systemy uczące się, Akademicka Oficyna Wydawnicza EXIT, Warszawa Wyd. II. Larose, T. D. (2008), Metody i modele eksploracji danych, Wydawnictwo Naukowe PWN, Warszawa Wyd. I.
Ooghe, H., van Wymeersch, C. (2006). Traite d’analyse financiere, Kluwer, Antwerpen. Ozkan, A. and Ozkan, N. (2004). Corporate Cash Holdings: An Empirical Investigation of UK Companies, Journal of Banking and Finance, Vol. 28, pp. 2103–34. Porada-Rochoń, M. (2013), Modele decyzji finansowych mśp w wybranych krajach Europy Środkowo-Wschodnie w warunkach zaburzeń finansowych, Polskie Towarzystwo Ekonomiczne, Szczecin. Schendel, D., Patton., G. R. Riggs, J. (1976). Corporate Turnaround Strategies: A study of Profit Decline and Recovery. Journal of General Management, Vol. 3 ( Issue.3). Smith, H. Graves, W. (2005). Gentrification as Corporate Growth Strategy: The Strange Case of Charlotte, North Carolina and the Bank of America. Journal of Urban Affairs, Vol.27, pp. 403–418. Steven, D., Usdin A., Bloom, M. (2012). Identifying Signs a Company Is in Financial Distress. The Legal Inteligenrer, Vol.245, NO. 80. Reprinted with permission from the April 25. Sulphey, M. M., Nisa, S. (2013). The Analytical Implication of Altman’s Z-score Analysis of BSE Listed Small CAP Companies. Journal of Commerce and Management Perspective, Vol. 2 (Issue 4), pp. 45-155. Sudarsanam, S., Lai, J. (2001). Corporate Financial Distress and Turnaround Strategies: An Empirical Analysis. British Journal of Management, Vol. 12, pp. 183–199. Verbeek, M. (2004). A Guide to Modern Econometrics, 2th edition, Wiley. Hoboken, NJ. Wallace, R.S.O., Naser, K., Mora, A. (1994) . The relationship between the comprehensiveness of corporate annual reports and firm characteristics in Spain. Accounting and Business Research,Vol.25 (Issue 97), pp. 41-53. Zimmerman, F. M. (1991) The Turnaround Experience. Real World Lessons in Revitalizing Corporation. McGraw-Hill.